Dell’s new 2-in-1 laptop just went on sale. But what’s most interesting about it is that it’s the first 2-in-1 computer to support wireless charging. That is, if you shell out the extra $550 it costs to get the 7285’s wireless charging keyboard accessory and the charging mat that goes along with it (keyboard only will set you back $380, the charging mat is $200). Mind you, the tablet computer is already pretty steep starting at $1200. While the tablet itself doesn’t actually charge wirelessly, you’ll need to have the 2-in-1 docked to the wireless-compatible keyboard. 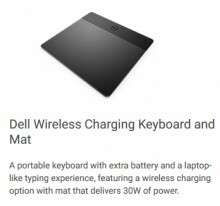 In addition, Dell says that the charging pad is not designed to be used on metal surfaces. In fact, if you want to use the computer on a metal surface, you’ll need to use a non-metal stand that would raise the base at least 50mm (almost 2 inches). Perhaps wireless charging isn’t the most practical (or cost effective) method of charging on the Latitude 7285 2-in-1. The Dell Latitude 7285 starts at $1200 with a Core-i5-7Y54 and 128GB of internal storage. 8GB of RAM and a 12-inch display really push the entry-level specs. Check out Source 1 for the press release or Source 2 for Dell's product site.